This compact Simulator packs a lot of punch in a small package. At only 7” X 4” X 1.25 inches, AMPS-1 fits comfortably in your hands and all leads and cables are conveniently fed from the top and bottom ends. Operate from the single 9 volt alkaline battery or with the optional battery eliminator. Full 12-Lead ECG with 9 independent outputs for each signal lead referenced to RL. Output Impedances: 500, 1000, 1500, & 2000 ohms to RL. High Level Output: 0.5 V/mV of low level selection. Amplitude Accuracy: ± 2% 2 Hz Square Wave (Lead II). Rates: 30, 40, 60, 80, 100, 120, 140, 160, 180, 200, 220, 240, 260, 280, 300 BPM. Accuracy ± 1%. Amplitudes (Lead II): 5mV, 4mV, 3mV, 2mV, 1mV, .5mV, .25mV, .1mV. ST Segments: 16 total – 8 elevated & 8 depressed. ST Segment Levels (Lead II): -0.8 mV to +0.8 mV in 0.1 mV steps on Lead II. Axis Deviation: Normal (intermediate), horizontal, and vertical. Modifies baseline ECG during arrhythmias. Neonatal Mode: ECG R wave width is reduced to 40ms. Sine Waves: 0.05, 0.5, 1, 10, 25, 30, 40, 50, 60, and 100 Hz. R Wave Detector Test: 60 BPM haver-triangle wave with selectable ampl. and width. Amplitude (Lead II and V Leads): 5mV to 0.5mV. Non capture, Non function. – Pulse: -700 mV to +700 mV. Width: 0.1, 0.2, 0.5, 1.0, 2.0 ms. Accuracy is 5%. Accepts input during defib training. RS-232 Interface: RS-232 interface to PC. 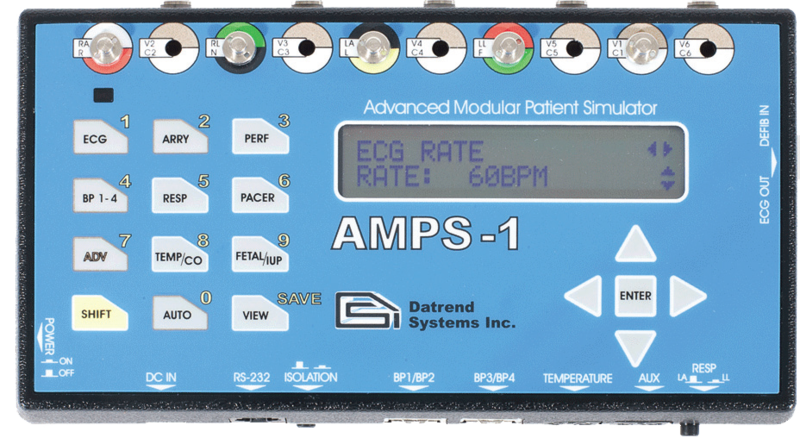 With two emergency scenarios and a cardioversion procedure, AMPS-1 can be used for basic defibrillator training. Baseline of 36, 37 and 38 degrees °C. Selections for 2 and 20 degrees °C. Electronically Switched Temperature of 35, 37, 38, 40, 42°C. Respiratory Effort (Inspiration/Expiration Ratio): 5/1, 4/1, 3/1 (normal), 2/1, 1/1. Dynamic BP waveforms are synchronized with normal sinus rhythm rates and track arrhythmia selections.